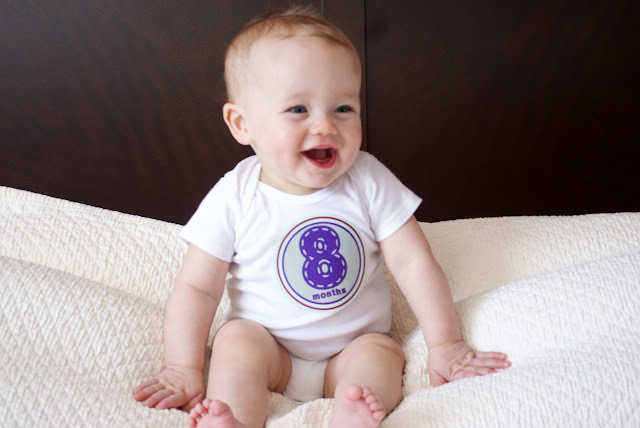 Charlie turns nine months tomorrow (nine months!) so of course I am just now taking and posting the pictures of him in his eight month onesie. But I made it. Technically, I made it. And it was no easy task, mind you. Mr. Mobility is not one to sit still these days, and he so wanted to tear that eight right off of his shirt. He does put on quite the show, though. Chip would plop him in the middle of the pillows, and he would have a ball flapping his arms and clapping until suddenly he worked himself down among the pillows. And if he didn't do that, he would launch himself forward and tumble down onto the bed, laughing the whole time. Clearly, we're all about safety with the second child. Which is why I may or may not have done my darnedest to remove the latest bruise on his forehead.